Of all the great and ancient architectural projects of the world, we like to think of the pyramids. They exist all over the world and most prominently in Egypt and Central America. But there is another strange and equally as mysterious monument, also found in Egypt as well as many other parts of the globe. That is the obelisk. We see them everywhere. They are tall, squared-off towers with wide bases that taper gradually toward a pointed top. But instead of reaching a point, they are usually capped with a small pyramid. What is so amazing about the ancient obelisks found in Egypt, throughout the old Roman Empire and even the Americas is that they are cut from solid rock, they stand from 40 to 100 feet in height, and they weigh several tons. The mere task of cutting, moving and then raising them involved an incredible feat of engineering. A large contemporary obelisk known as The Washington Monument stands in Washington, D. C. It is made of marble, granite and bluestone gneiss, but it was built from the ground up over a period of 40 years. At 555 feet, seven inches, it is the tallest obelisk in the world. Built in the Nineteenth Century to honor George Washington, it has a hollow interior with an 897-step circular staircase allowing visitors to climb inside of it. An elevator was recently added. As stated, this monster took 40 years to construct (with delays due to the Civil War and typical Washington political buffoonery mixed in). It was finished and opened to the public in 1888. The big mystery about obelisks is that they can be found all over the world. The ancient ones were hand crafted out of solid stone and weighed hundreds of tons. Many were built in Egypt but then moved to Rome by the Romans. This raises yet another question, however. Once they were made, how did people successfully move such long and heavy blocks of solid rock for such distances and then raise them to a standing position? The other question is why? The largest standing solid rock obelisk is known as the Lateran Obelisk. It measures 105.6 feet in height and weighs 455 tons. It was made in Egypt, moved to Rome, and today stands in the square in front of the Lateran Basilica. The story of how this giant stone structure was moved to Rome in ancient times and then successfully raised is almost impossible to fathom. A description of how a smaller, 82-foot, 331-ton obelisk was moved in 1586 to its place at Saint Peter’s Square in Rome, is enough to boggle the mind. This one was cut in Egypt in about 37 AD but apparently was never raised. Then in 1586 the decision was made by Roman Emperor Gaius (remembered as Caligula) to bring the obelisk to Rome. To accomplish this amazing job, workers first excavated the ancient obelisk from the debris of the ages, then moved it on rollers to the Piazza. It required about 1,000 men, 140 carthorses and 47 cranes, and the work went on from April 30 to May 17 that year just to get it moved. A special barge was constructed to carry the obelisk across the Mediterranean to Rome. They said the vessel was so large its mast made of fir wood was so thick four men's arms could not encircle its base. It took 120 bushels of lintels for ballast to keep the vessel upright once the massive rock obelisk was on the deck. After delivering its special cargo, the Romans had no further use for such a massive vessel. They filled it with stones and sank it to form the foundation of a new harbor being built at Ostia. Once it was delivered at the piazza the next task was to successfully raise the massive rock spear to its upright position. First a nave was constructed to support the weight of the obelisk. A special kink was placed to line the nave precisely with the base of the obelisk. 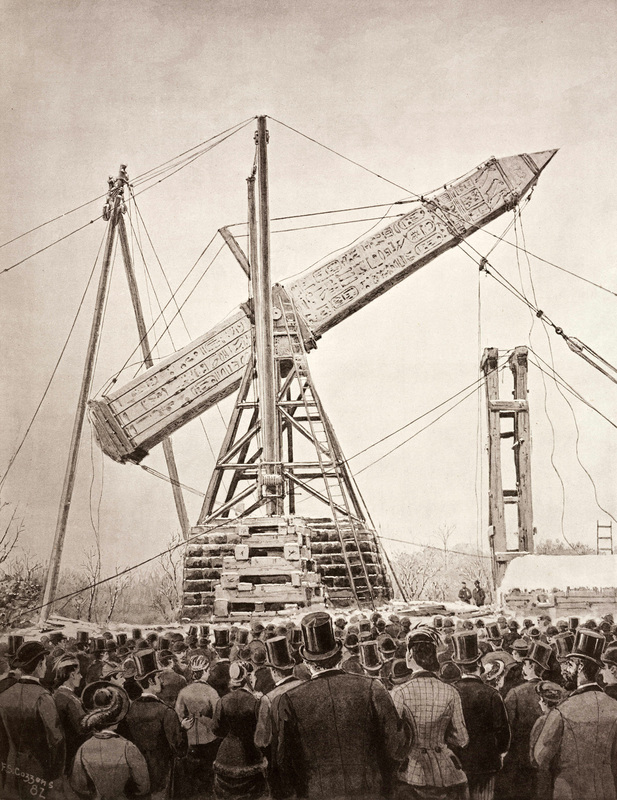 It is believed that massive frames of hardwood were constructed as machines used to balance and raise one end of the obelisk while workers removed dirt at the base, causing the bottom to slowly sink into position. A hint at how the obelisk was erected was found on a 3,000-year-old papyrus scroll which simply says: "Empty the space that has been filled with sand beneath the monument of thy Lord." Contemporary experimentation with raising much smaller obelisks found that a large pit of dry sand under the base, plus volumes of stones and mud could be used to slowly drop the base of the obelisk while a large crew of men pulled on ropes attached to the upper portion. When successfully raised, the base of the obelisk then rests deeply entrenched in the nave. There are numerous broken obelisks found throughout Egypt and Europe, grim evidence of failed attempts to raise them. Once Gaius successfully raised his obelisk, later Roman emperors had to have their own obelisk. Three more were erected in Rome under Sixtus V. It seemed to be a fashionable thing for the emperors and kings throughout Europe to do, to have obelisks raised in their memory. They say that even though few of them were made there, Rome eventually became the obelisk capital of the world. So what is the significance of the obelisk? Some believe, at least for the Egyptians who's most powerful deity was the Sun God Ra, the very shape of the obelisk appears to represent a ray of sunlight. Yet the history of the obelisk seems to go back to a very ancient time, long before the Egyptians were carving them. It is believed that the monolithic Menhirs, or massive tall uncut rock formations raised on their ends, dating as far back as 15,000 years, were the first attempts to raise an obelisk. Like the detailed obelisks that were built much later, Menhirs also were found on every single continent where humans mounted large boulders. There are thousands of them, many of them still standing. It should be noted that obelisks are still being erected, as shown by the Washington Monument in Washington D. C. The unanswered question still persists, why have humans continued to erect such massive and towering structures for over 15,000 years? "Perhaps on one level of sophistication an obelisk is just a big rock, or a phallic symbol, or the rays of On or lightening rods or any number of revealing or concealing projections. The answer to what these monolithic obelisks mean when they stand before you and what they mean when symbolically presented at the deepest level may be quite different." In other words, only the builder knows why it stands where it does.